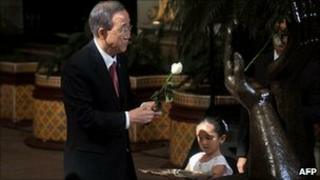 UN Secretary General Ban Ki-moon has promised to support Central America in its fight against insecurity and violence. "Organised crime is an international phenomenon that requires a regional response," Mr Ban said after meeting Central American leaders in Guatemala. Mr Ban also extended the mandate of the UN Commission against Impunity in Guatemala for two more years. Central American countries have some of the highest murder rates in the world. The meeting with the UN secretary general was attended by presidents Alvaro Colom of Guatemala, Laura Chinchilla of Costa Rica and Porfirio Lobo of Honduras. Belizean Prime Minister Dean Barrow and representatives of El Salvador, the Dominican Republic and Panama were also there. Only Nicaragua did not take part. Mr Ban promised the UN's support for a conference on security in Central America to be held in June, calling it an "excellent opportunity" for the international community to show its support to the region. Central America has been suffering a wave of criminal violence, much of it blamed on street gangs, with El Salvador, Guatemala and Honduras particularly affected. There is also concern about the rising influence of Mexican drugs cartels, who use the region as a transit route for South American cocaine. Earlier, Mr Ban announced the creation of a $10m (£6.2m) UN Fund to Consolidate Peace in Guatemala, which ended a decades-long internal conflict in 1996 but has since struggled with rising crime. "Guatemala is known throughout the world for its diverse ecology, its rich culture and its proud history," he said. "Our common challenge is to ensure Guatemala also becomes known as a cradle of peace, security and justice." Mr Ban also reaffirmed his support for the UN Commission against Impunity in Guatemala, extending its mandate for two years. Since 2007 the commission has been working to strengthen Guatemala's justice system and transform a culture in which most violent crimes go unpunished. In Guatemala there are 52 homicides per 100,000 inhabitants each year, compared with 14 in Mexico and 5.4 in the US. And according to UN data, more than 95% of murders are never solved.